I woke up this morning and turned on the radio only to hear someone from the Museums Libraries and Archives Council lambasting the Bury Council for deciding to sell an L.S. Lowry painting. I have to admit that the painting, A Riverbank, pictured above, is a particularly handsome one, even though Lowry's not my cup of tea. Something creepy about those matchstick men and the way they all look like little ants swarming around an anthill. The MLA is threatening to kick out the Bury Museum and Art Gallery for selling the painting and potentially removing it from public display. Apparently, it's to be sold at Christies next month for £500,000 - practically a drop in the bucket for a council that's some £10 million in the red. Worse, if the museum loses their accreditation, they could be ineligible for lottery funding, according to the MEN. That's what happened to the last museum that sold a painting - oddly, a Lowry - back in 1991. I have to say, I don't see what the big deal is here. It's too bad that the council feel they have to sell the painting to plug a hole in their budget, but they very likely have no other choice. The Bury Art Museum and Gallery maintains an excellent and ambitious programme that would do credit to a much larger (and better funded) institution - their recent series of contemporary solo artist exhibitions is a great example. If it's a choice between closing the gallery and parting with a Lowry, it's no contest as far as I'm concerned. 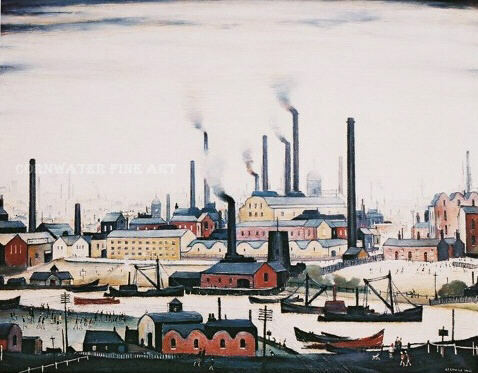 And if people want to see Lowry paintings, there's a whole museum full of them a short tram ride away. The Lowry matchstick people are meant to be creepy. To notice that means you're noticing what Lowry is often really about. But does that mean you don't like something like Munch's The Scream because it looks a little anxious? Actually, I don't like the Scream either. In either case, however, I don't think it's a question of subject matter, it's that the style doesn't appeal to me.